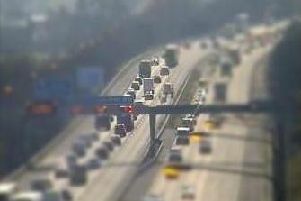 THERE are still lengthy delays on the M6 after a HGV fire this morning. The southbound carriageway and one northbound lane have since re-opened, with two still closed while emergency services continue to work. Early reports from the Highways Agency this morning also suggested that there had been a serious collision but it’s believed that was not the case. Motorists are being advised to look for an alternative route with congestion still backing up to junction 26 at the Orrell interchange. Repair work is expected to be ongong until 5pm. Traffic has been backed up throughout northern areas of Wigan such as Shevington and Standish as well as Chorley and Wrightington as a result. It’s the second time in 24 hours that rush hour commuters have suffered serious delays on the motorway. Yesterday morning, emmergency repairs in Lymm meant southbound traffic was stretched back to junction 28 with it taking more than two hours to travel just 20 miles.